It is a tremendous thing that someone has started a blog that deals with LEGO vehicles because on other famous blogs there are not enough vehicles published. That is kind of a shame because there are so many people that do beautiful vehicles like Steven Marshal. Check that guy out. I would like to contribute with my own MOC’s so feel free to check my MOC page. There are several vehicles that you might like. Thank you for starting something like this. I am checking it on a daily basis. Unfortunately MOCpages is having its weekly sulk and refusing to work, but we’ll be sure to check out your work. We tend to only post new MOCs mind. We look forward to your continued readership (and maybe you’ll even see your work here at some point too). Does anyone know where I can find the Lego Citroen Avant set to buy? My fiance just bought the car to do a full restorement on it, so I would LOVE to get him this. Please email me at traciwright5@gmail.com if you have any links for me! Thank you! Hello Traci. I built the Citroen that you like – thankyou, I’m very flattered especially as you have a real one ! I’d be delighted to make another, but do remember that things like this are more complex and fragile than a typical Lego set, and more expensive. If you message me with an e-mail address we’ll talk further. I would like to suggest a spectacular (IMHO) Technic MOC which has just been presented by Hypo (Heiko) in the German Forum 1000steine (http://www.1000steine.de/de/gemeinschaft/forum/?entry=1&id=2280#id2280). It is a huge Rosenbauer Panther ARFF. Check out Hypo’s Brickshelf folder, too: http://www.brickshelf.com/cgi-bin/gallery.cgi?f=484931. There are also some videos on YouTube. In my opininion it is one of the very best Lego ARFF around, design and functions are outstanding. I think it has not been blogged before (or at least I did not find it). Anyway, you do a great job here (I am very proud about having been blogged on the Lego Car Blog already). Thanks for your attention! Thanks for the tip Marcus – that looks spectacular. Suggestions: keep featuring cars and set reviews! I have a 1/11 scale Hummer H1 that I wouldn’t mind if you decided to feature. Here is the link to my LEGO CUUSOO page so you can see it. If interested, I can get you better photos and shoot a video if wanted. This is exactly the sort of thing we’re looking for. I do need to ask if this is your own design though, before we would be able to consider it. Also, the answer to your question is below. I am not doing so well at working the blogosphere today! http://legokitteh1138.wordpress.com/ Just read the post “Project of My Life” and you will get the “brief” story behind it along with some more pictures! Oh yes, it is very much my own design. I have some 30 different LDD files with various sections of the vehicle mapped out, plus the completed model. I started the project when I was 14. Finished when I was 21. I have pages of notes to make sure I scaled the vehicle correctly. Sure, I took inspiration from other builders to get me going, but there is no other Hummer like it on brickshelf or mocpages. Hi. So great to see this blog for people who are doing cars. I want to be on it! (if you will have me) Please check out my flickr page. It would be so great to see my stuff here. Thank you for your support! We’ll be sure to look at your work. We’re also always on the look out for more Lego Car Blog writers too, so anyone reading this who may be interested, please get in contact via the comments. Can I point you to my recent recreation of James Bond’s iconic spy car, the Aston Martin DB5? Pictures can be found on my cuusoo site. Many are newer and ‘better’, but there are tons of older stuff which I don’t think are worth blogging 🙂 Could you maybe give my recent Corvette consideration? Hi Isaac. Welcome to TLCB : ) A few elves have mentioned your pages before actually, so we’ll be sure to take a look and see what’s blog-worthy. Are my cars too old, like do you only show fairly new vehicles? Yes, we try to only show new posts otherwise our readers may well have seen the MOC before. Thanks for an awesome blog 🙂 I absolutely loved trying to build my own cars with lego, but they sure didn’t look as nice as any of these! Thanks Michael, we’ve checked out your blog too – it’s looking good. For those into motorsport, click Michael’s name to see his racing blog. 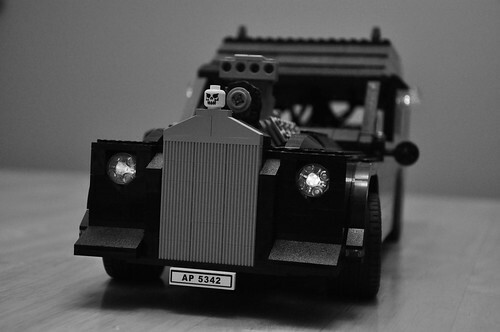 Just a quick note to see if you would be interested in a guest blogger for The Lego Car Blog. My name is Carlo, I like building little LEGO models and I am also very fascinated by LEGO related robotics, design and art. •	5 cool LEGO Design pieces – from LEGO ice trays to belts, interesting items to show off LEGO love. •	How to do LEGO stop motion – software and equipment needed to produce your first LEGO YouTube video. Please let me know if you would be happy to consider a guest post from me and I’ll get something written up and sent over to you. I also share all of my guest posts on my social profiles (Twitter, Facebook and StumbleUpon) in order to drive more visitors to your site. Probably bullet points 1 and 3, as long as they were vehicle-related. Let us know your email address in a comment (which we can delete while it sits in moderation so it doesn’t show on the site). What makes Lego so interesting? hi there im new to this blog, but i like to look at Mocpages! I love military and WWII tanks. i was just checking out some planes on Mocpages and ran across 2 planes i really like. The first one was by John lamrack , http://www.mocpages.com/moc.php/279402 , i really liked the plane, but i saw a few mega blocks The second plane i encountered, was Jon treasure, his was a great plane also, the only con i saw on his was that the wings were droopy a little and when they were spread forward they exposed a few parts that didnt look as good. ( for me its a toss up between the two) http://www.mocpages.com/moc.php/318890 . Im hoping you guys could pick one of these planes (or both of them!) and maybe blog it. Thanks for your time! These are both fine MOCs. We’ve actually featured some of Jon Treasure’s models before (so you’re on the same wavelength as us!). We do however, only post new creations (i.e. uploaded in the last week or two), so that people don’t see things that they’ve known about before. Ok thanks! i really like your website! I would love to search for some new planes, maybe not today though, because im pretty busy. Thanks, i will be searching for new planes throughout the rest of this week! I have always been a fan of LEGO planes and I came across this one the other day: http://lego.cuusoo.com/ideas/view/21388. I have always found it hard to build nice looking planes! Hi Matthew, Thanks for your comment. That plane is superb! Do you know if the owner has made it in real bricks at all? If so we’d love to feature it. Readers; click on the link in Matthew’s comments above to see it in LDD. I do not think the owner has; in the page is says “late Q1 2012”, so I assume not. It is quite a shame that he/she has not made it (yet)! Thanks Josh, and welcome to TLCB! That is a spectacular creation. The Elves have stumbled across it a few times, however unfortunately it’s too old to feature on the blog. To our readers; it’s well worth a click on Josh’s link if you’ve not yet seen it. Hi admin, I would appreciate it very much if you use as reference my flickr photostream instead of other sites when you blog anything of my stuff. Thanks in advance. 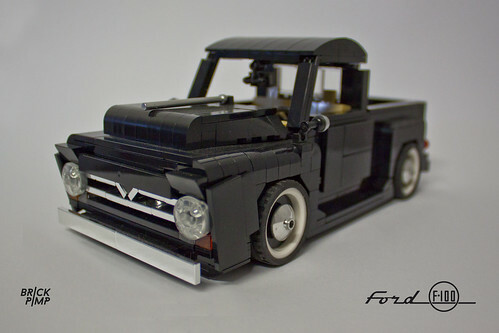 You guys should check this truck out: http://www.eurobricks.com/forum/index.php?showtopic=78485. It’s a Scania 143 Streamline V8 500 made by Bricksonwheels. Hi again all, I’ve got some new stuff on my Flickr account! I featured a link to your Martini post at LaMinunat.com should be published on January 30, 2013! Hello, i have created Toyota 1:9.5 scale. You can post it here. Dont know whats happened, but my previous post disappeared. Hello Egor! That is a truly superb model, and perfect for TLCB! 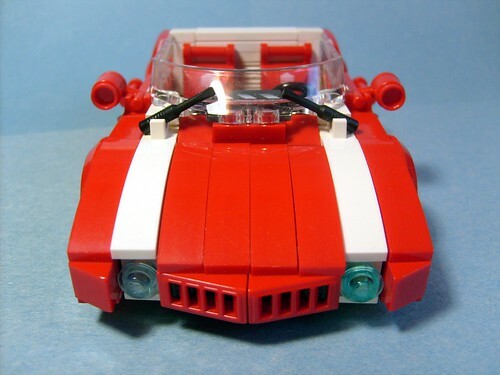 However, we only post ‘new’ creations (and if we change that now we’ll be inundated with requests), so… if you happen to post a new picture or two to Brickshelf, or upload your pictures to Flickr, we’d be able to feature your vehicle (hint hint!). Let us know if some new pictures are going to appear. You mean, it is too late to post it, cause it was already posted in october 2012? Do you post deep modifications of Lego sets? Yes, although if you posted a new picture, or uploaded your pictures to a new medium (e.g. Flickr), then we could feature you here (in short post one new pic and you’ll be featured!). We have featured mods in the past, but only if they use very limited parts from the original set (e.g the chassis only). Thanks for looking us up : ) Your Mercedes is easily good enough to feature on TLCB! If only we’d found you sooner (as we only post ‘new’ MOCs). Keep us posted if you build anything, and you may well see it here. Pow! Check out the front-page. hi, it would be great if you could show my cars on the blog also. Hello BRICK Pimp, and welcome to TLCB. Thanks for your links; just what we’re looking for. We’ll be featuring the F150 shortly. Thank you Bugattiboy, a fine suggestion. We’ve now blogged this builder on the homepage. Thanks for the update. Your crane has been featured today (6th April)! Thanks for all your suggestions. Please do keep them coming. If you don’t see your suggestion featured please don’t be disheartened. Some aren’t quite good enough, some are too old, some don’t fit with the line-up for that week, and some would cause the Elves to threaten a mutiny if we bypass them. Also, I surely wouldn’t mind becoming a TLCB writer. I think you guys should have more “Featured TFOL” posts and thing similar. We’d like to feature more upcoming builders. If there are any we should know about, please tell us via the comments. I think Senator Chinchilla (http://mocpages.com/home.php/16304) definitely deserves it, and perhaps make it more of an interview if possible. It’s a 1940 Nash Ambassador by Senator Chinchilla. A great find! We’ll post this model soon. Hmm… I might be interested in being blogger here. What are the requirements? We’re looking for intelligent, English-literate bloggers able to give about 15 minutes of their time a week (about how long it takes to write each blog post) to become part of (we think!) 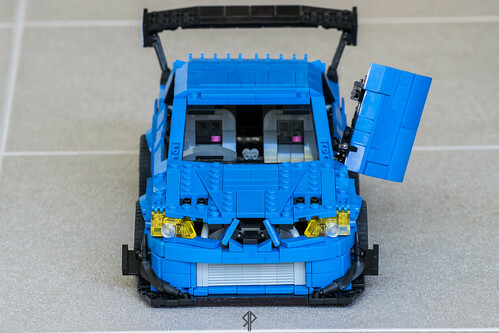 the best blog for LEGO cars there is. Beyond the above there are no special requirements. You don’t need to have blogged before; we’d like to help people with an interest in becoming a blogger to realise their ambition. If this sounds like something you may be interested in let us know, we’ll be contacting those who have shown an interest soon! How about 1nxtmonster’s Trial Truck with automatic transmission? First ever trial truck with an autotranny! Hello John, thanks for stopping by. Do you have a link? Great find. We’ll see if we can get to this later in the week. Hi. I have some nice alternate designs of Technic sets. My latest one is for the 9398 crawler that you may find interesting. But if not I will be making more in the future so I’m sure one day there will be something of mine worth featuring. Nice work. We’ll be watching your new posts with interest. Hi there guys, I was really honored by your featuring of the Volvexa, and I’m curious if you’d be interested in my latest build, the 1961 GQ B-Type roadster. Self-plugging links to follow, and I hope you enjoy viewing as much as I enjoyed building! You are very welcome. We like your latest work. We’ll see if we can fit it in this week. Great find, just the sort of model we’re looking for. We’ll see if we can fit this in later in the week. Hello Dentalspagat, thanks for stopping by. Both of those models are superb, and just the sort of thing we like to post. Unfortunately they’re much too old for us as we only post recently uploaded creations, however we’ll keep an eye on this builder now. Please see TLCB homepage dated 12th May. Any idea why I can’t see any pictures last couple of weeks? I tried FF20 and IE10. Is anyone else having difficulty seeing pictures? Judging by the screen shots of TLCB that we’ve seen uploaded by Flickr users it looks like the site is functioning correctly, so we suspect this is a problem with your browser or PC. If anyone else is having this issue please let us know, otherwise good luck fixing the issue Marin! The second looks very fun. We feature Nico71, whose design your 4×4 is based on, from time to time. We do like it. The Elves especially (they’re making ‘vrum vrrrrrum’ noises). So many awesome Lego cars – love the ghostbusters wagon! Have you seen this super little mini-fig scale tow-truck? What a great little MOC. Our Elves had missed that one (shoots dark look at rapidly retreating workforce). It’s too old for us to post now but we’ll watch the builder with interest. Typically the creations we blog are under a fortnight old. 1nxtmonster’s trial truck with automatic transmission, the FIRST EVER! ITS EPIC! Thanks for stopping by. These are ace! We’ll look out for when this builder puts his technical innovations into a complete bodyshell – at which point we’ll be sure to post his work. Thanks again for sharing. Keep pushing on this nice blog. Best of luck with your Cussoo project. Another bike… from me… After “Little Racing Bike”, here is my Cafe Racer! Blogged. Thank you for your input. Thanks for stopping by. MOCpages does indeed appear to have crashed. We have Elves trapped in there… but we’re not too bothered about that, just that there won’t be any new creations uploaded for a while. We’ll be focusing the Elves on Flickr and Brickshelf during the downtime. In my opinion, he is a great builder. Thanks for the suggestion, We’ll keep an eye out for new creations from them. Why my friend “Senator Chinchilla”‘s Porsche 993 isn’t blogged?!!! Watch this space. Well, not this space – the homepage. Not sure if this is your thing but it does so much in such a small space and has a pull-back motor. Looks fun too! It is indeed. Would you like to be an Elf for a day? If so, post your text here or to pierrepanhard@rocketmail.com, and we’ll publish it (with due credit of course!). Thank you! I’ve sent you an e-mail with an MS Word doc attached. Thank you for taking us up on the offer David – your submission has now been published! And very good it is too. We may feature your entire blog soon (with your consent of course). Absolutely. Thanks for your work. I haven’t thanked David Roberts for an article he wrote about my car (Redster) and TLCB Team for featuring it.So, thank you guys, it’s much appreciated. You’re very welcome. David Roberts, who both suggested your creation and wrote the blog post, is the one deserving of thanks. I am Hayden roy a professional blogger. I found your blog “thelegocarblog.com ” interesting and wondering if I can do a guest post? I wish to write something according to your blog niche. If this is something you could allow me to do, may I as well add a single link to our site? Thanks for stopping by. You may indeed, providing it meets our mission and standards of course. Please let us know your planned content. In the coming weeks I will set up a website and make lots more models, I normally do all themes but I will be focussing on vehicles the next few weeks. We like the look of your work. We do only tend to features creations in real bricks though. Best of luck with your Cussoo project, and we hope to see more from you. Enjoy. I’m not expecting you to post them but they might just raise a smile. Thanks for stopping by! We like your models very much : ) You should definitely look at joining MOCpages or Flickr, you’ll find lots of like-minded builders! I dunno how your “antique car” quota is going this month, but I’d be honored to throw my latest MOC into the mix if you’d like it to help the elves meet quota. 😉 Thanks for the consideration, and here’s a couple links for you! Cheeky, but it worked. See today’s posts (27/06/13). Hello TLCB Team! Quick, blog this defense system by Nick Barrett (it’s called Yosemite S.A.M, funnily enough) before The Brothers Brick does. It’s not our usual kind of build, but we’ve found a way… check out the homepage dated July 4th to see. Thanks for stopping by, this is a lovely build. It’s in the queue and should be up on the blog homepage tomorrow. It’s a completely redesigned and manual version of a former MOC of mine. Even if this doesn’t go up, at least I’d like to say that you guys do a great job with this blog, so keep up the good work! A very nice MOC you have there. We have a bit of a queue of creations to post at the moment, however we’ve added you to our ‘ones to watch’ list – so keep MOCing and we’re pretty sure you’ll see yourself on TLCB. Thanks for your kind words, we’ve shared them with the Elves who have thrown a small party in your honour. If you have any questions, feel free to contact me. Thanks, and have a great week! Thanks for stopping by. We really like this (TLCB readers; check it out at the links above!). Unfortunately it’s too old, almost 2 years, to publish on the main blog – however if you upload any new photos let us know and we’ll see what we can do. Best of luck with your Cuusoo project. Sorry for the late reply, and thanks for your reply. 🙂 I understand your reasoning in not being able to post the MOC. Gotta stick to standards. I did make a 1902 Oldsmobile Curved Dash recently, and when I get some good pictures up, I will write back to you. Mine ship the SL Gabon is ready and at mine flickr acount you can find the new photo’s. Thank you for updating us, and taking the time to answer our questions. Your finished model looks fantastic and is scheduled for publication on Saturday 27th July. We look forward to adding you to our master series! Take a look at his new Steampunk Tumbler + Batcave. We always take notice of comments from a previously blogged builder! Your suggestion is marvellous – we’ll definitely publicise this creation. Would you like to be a blogger for the day? If so let us know and we’ll pass you an email address that you can submit your words to! If not, we’ll blog this creation as normal. I would feel honored to serve as a guest blogger for this entry. You can send the e-mail address to the contact adress I posted with my suggestion. A member of the team has contacted you via your Flickr account email. We look forward to seeing your post! There is a bug in my web-based e-mail account, so I can’t use the original e-mail address for the reply. I hope it doesn’t disappear in the spam folder … You can find my other e-mail address added to this post. No problem Nils, we’ll look out for your email. I like your blog a lot, and I’d be very glad if you’d take a look at my last car, a DeLorean DMC-12 (not the one from BTTF). I think that it fits very well on this blog. A nice model you have there. We’ll see if there is space for your DMC-12 later in the week. It’s what I’ve done, for your viewing pleasure!!! Another nice bike you have there. We have a few posts planned for this week but we may be able to fit your latest work in – we don’t always respond to self-requests but you know we like your creations! Hey guys! I have always read your blog; its quite nice! I understand that you all enjoy some diversity in your posts as well. I do have a suggestion here: http://www.mocpages.com/moc.php/366353 It is a ship; and quite a big one. Maybe for something a bit, left field? Thanks for your suggestion, that is a hugely impressive creation! Unfortunately it’s a little old for TLCB as we suspect many of our readers have seen it already, however now that we know of the builder we’ll inform the Elves to keep an eye on them for future builds, especially as they could be a potential ‘Featured TFOL’. Hey guys! I saw the comments above me; how kind Legoturner! Anyways, I would like to propose this MOC: http://www.mocpages.com/moc.php/367709 It was inspired by MOC, but what is special is that the builder is building from an EXTREMELY reduced collection. India isn’t exactly well known as a LEGO marketplace. He has managed to make quite a large creation from his limited resources; despite the “rainbow warrior” look, I feel he deserves a mention. Two suggestions in one day; must be a record: http://mocpages.com/moc.php/367753 All I have to say is this: Lego Builder JR. is back……. Thanks for stopping by and for your submission suggestions. Your second suggestion will be added TLCB homepage 18th August 2013. Yep, back again 🙂 http://www.mocpages.com/moc.php/368261 By a builder named claw paradox. Very talented; and some brilliant tanks on his page. Highly recommend him…. Welcome back to the Feedback page! We have a bit of a queue to get through at the moment so we might not be able to blog this one, however the Elves are now watching this builder so they have a good chance of making it here in the future. Thanks for stopping by. 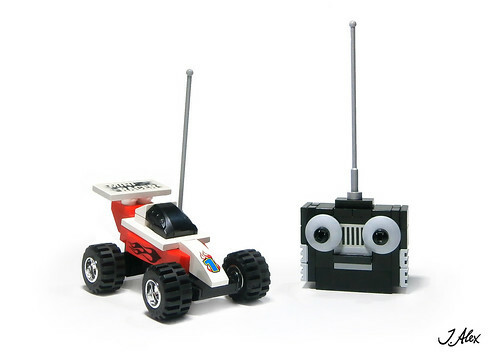 Both your suggestions are just what we look for here at The Lego Car Blog. The big green grader is an unusual vehicle, but the Elves like big machines and are jumping up and down so that we post it – so watch the homepage in the next few days! Thank you for blogging some of my builds, I’m very honored! I’m here to ask if you could do a tribute to possibly the greatest car group on the ‘pages, The Rod Club. Unfortunately, after 5 years, the group administrator, Ape Fight, is shutting down the ‘Elite Builders Section’ and the ‘ROTM Award’, leaving the group to only accept new members and MOC’s, so now it’s basically ‘frozen’ as Ape posted. You can read more about the group and it’s rich heritage here… http://www.mocpages.com/group.php/47. Would you like to write a short ‘Group of the Month’ feature for us? Take a look at our past Group/Blog of the Month features via the Search function, and if you’d like to write one for us for this Group, as we can see some great builders in it, let us know and we’ll pass on an email address that you can submit your article to. I would love to write a short feature for you! It would be a great opportunity for me and I thank you for it. Once I receive your email, I get writing as soon as possible. Here my tribute to one of the greatest designer: BERTONE. It’s my 1/13 SCANIA 164G. I hope you’ll consider for TLCB. Thanks for stopping by. This is just the sort of model we like to feature here at TLCB. We’ll see what we can do. Hello TLCB! That builder I was telling about, Achintya, has posted another creation; here is a link: http://www.flickr.com/photos/99826668@N06/9594311076/ Its the USS Cole. Thank you for suggestion. It has been blogged on August 27th 2013. Great Blog. My son and I love Lego. Recently posts about the simpsons lego coming next year. Imagine the possibilities for simpsons lego cars. Lol. I really like this Blog, it’s very organized and got some really interesting ideas… In the last days I’ve been looking this page twice a day, waiting for new posts. Thanks to you I discovered excellent new builders, Excellent new creations, I mean, lots of nice stuff, And thanks to you I became a better and more known builder. Also, a thousand thanks for making blog posts about My Apollo S, Ultimate Aero 3, Porsche 911, Tonagari Solace and 787B. I really appreciate your opinion about my cars, so I would like to ask what do you think about my brand new Jaguar F-Type (http://www.mocpages.com/moc.php/368500). Thanks for stopping by, and for and your kind words. It’s always good to hear from a builder that the Elves like! That’s a very nice creation in your comment, you certainly deserve the compliments you have received from fellow MOCpages users. 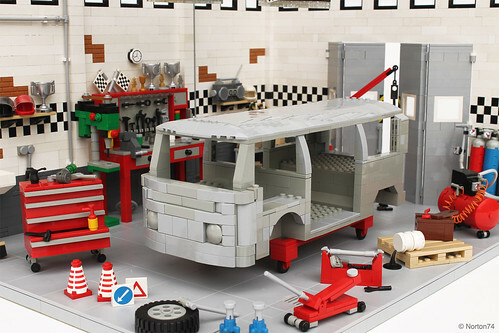 Here at The Lego Car Blog we like to feature all sorts of vehicles, but the Elves’ favourites are the ones that look good and that we can use to teach them about mechanics too. Perhaps your next challenge could be to include some technical developments! Thanks for stopping by. Your suggestion will be featured on the homepage on the 3rd September 2013. Thanks for stopping by. That’s an excellent creation and just what we look for here at TLCB. We will see what we can do to feature it this week. I can’t believe it, I’ve just found out that TLG has almost “copied” one of my favourite MOCs, my 4-wide VW camper. I have used some ideas from other builders myself and TLG had a 4-wide VW bus in their Cars series, too, but they really look quite similar. The 4-wide Camper is a giveaway at shop.lego.com (set #40079). Take a look at it, yourselves (http://www.brickset.com/detail/?Set=40079-1) and compare it to my one (http://www.mocpages.com/moc.php/329631). Looks like LEGO’s designers have the same building style as you – a career opportunity perhaps?! I bet you’ve already seen that, but nevertheless I’d like to lead your attention to a fantastic scene of a classic race team that Nick Barret has posted today. Thanks for stopping by. This is just the sort of creation we like to blog! Would you like to be a guest contributer for this creation? We’re glad to have you as a guest contributor. Apologies to rush you but we need your text by this weekend. If this is too soon don’t worry, you can always blog another creation at a later date. it’s me again, I don’t want to annoy you, but Alexander Paschoaletto’s new 14-wide Bugatti Veyron is one of the best I’ve ever seen. It’s extremely well shaped and has a lot of cool funtions like a working rear spoiler and a pullback motor. Thank you for another excellent suggestion. On this occasion we aren’t blogging this due to a high rate of submissions in the last week, and we like to have a variety of creations and builders featured. Hi! I just discovered this blog, and I love it! Take a peek at my Jeep. I made it sometime in January, but I just posted pictures the other day. It’s my first MOC, but I think it turned out pretty well. Thanks for stopping by, we’re glad you’ve found us! That’s a very nice creation. MOCpages is a great place to share your models with like-minded builders. We have a back-log of articles to publish this week so we may not be able to fit you in, however rest assured the Elves are now watching you! Maybe you’ve missed it but the’re now instructions available for my towtruck xl you’ve posted about a year ago :). Great to see you sharing your design with those who want to recreate it. We have contacted you via FlickrMail to see if you would like to publicise the instructions here. Hi again, folks from TLCB! Another very nice model with some excellent comments attributed to it. It was suggested to us to blog, however as we have a busy schedule of posts and you’ve featured a few times on TLCB before it was decided on this occasion not to blog it, but it is definitely the standard we look for. The Elves like fast cars, and they also like working functions (steering, suspension, engines and suchlike), we think this is where you could develop your skills next. Apologies, TLCB is no longer accepting self-requests for creations. ‘News’ items (e.g. the launch of a new website, book or service) will still be responded to however. Requests to publish another builders’ work remain very welcome, and we will try to respond to as many of these as possible. Thanks for stopping by and for your suggested creation. We have a few creations to post this week, however if we have a spare day we’ll see if we can fit this EB110 in to the schedule. Thanks for stopping by, and for your suggestion. The model in question is excellent, however the photography is less so. Our apologies, TLCB requires clean backgrounds to post. We suggest a note to the builder to encourage a new photo-shoot, which would allow us to publicise this creation. Hi guys, I have found a real cool alternative 41999 Truck, check it out at. ( http://mocpages.com/moc.php/370091 ). This is the second request for this particular creation. We like the model very much, however the photography quality is below what we’d normally accept. But as this now makes two of you requesting it, we’ll see if we can edit the photos a bit to bring them up to a good enough standard. If you know the builder however, please hint that a clean white background (paper will do!) and no flash goes a long way! Ok, thanks I will tell him, do you also post rock crawlers on this blog, I am thinking of rebuilding my rock crawler ( 2 large motors and Pf steering ). Here is the website to check it out: http://www.mocpages.com/moc.php/356997 , I would also try to make good photos, but its not easy, because I am only 13. We sure do. To see the rock crawlers that The Lego Car Blog has featured use the Search function at the bottom of the page. Thanks for stopping by. We will see if there is space for this creation this week. Not sure if you guys have seen this incredibly unique vehicle from Peteris Sprogis, I’m not exactly sure WHAT to call it (a buggy? ), but whatever it is, it’s cool! Thanks for stopping by. We hadn’t seen this. We’ll see if there is space for this creation this week. An Elf had already returned with your latest work. It’ll be up shortly. The Lotus 99T is due to be posted today (September 27th). Thanks for stopping by. Wow, that’s pretty epic! Unfortunately none of of the photos are suitable for the main page, but we’ll watch this builder. Hay, I’ve found a new Harry Gravett’s Masterpiece that you’ll certainly like. It’s a Ferrari 360 Challenge, a car that is not usually recreated in plastic bricks. Thanks for stopping by. This is an excellent suggestion and we’ll aim to follow it up this week. There’s a motorcycle special coming shortly, we will ensure that your suggestion is included. Thanks for stopping by. Your suggestion has been accepted and is on the homepage 21st October 2013. He designed a Dodge Challenger ’70 R/T very nice design….. Thanks for stopping by. Your suggestion has been accepted and is on the homepage 22nd October 2013. This is a great creation, and just the sort of model we like to publicise. However we only blog creations under a week or two old, and this, though excellent, is much older. As such we can’t blog your suggestion this time but please keep your submissions coming in. Another great model that’s unfortunately still a little too old. You’re hunting the right stuff though; we’ve featured a few models by this builder in the past, so you like the same things we do! Ideally we need a creation less than 1 week old. Thanks for stopping by. Apologies, we are no longer taking self-requests. However, that is a great-looking truck. I believe your work has featured here in the past too! Hey guys! It looks Achintya is at it again: http://www.flickr.com/photos/99826668@N06/10500135166/ He’s built a few other MOCs, but I think this one really stands out…. Thanks for stopping by. We agree, this is a great model! It needs higher quality photos though. Though not a car, I recently finished the Gold State Coach (carriage belonging to the Royal Family) and put it up on CUUSOO in hopes that folks might be interested in seeing it become a set. Miniaturized versions of it have been produced in the past. If you don’t mind sharing it, please let me know. Thanks for your time,, and have a nice weekend! I just read you’re no longer taking self-requests. I’ll remember that for future reference. I can’t seem to reply to your reply directly, so I’ll do it here. 🙂 Anyway, thanks for your reply and consideration. I can definitely see how that could become problematic, though. There are a lot of great MOCs out there, and it would be difficult to give every single one attention. Hey there check these two mocs out! Thanks for stopping by. Some good finds there, the first of which will be blogged shortly. Hope the trip’s going well! 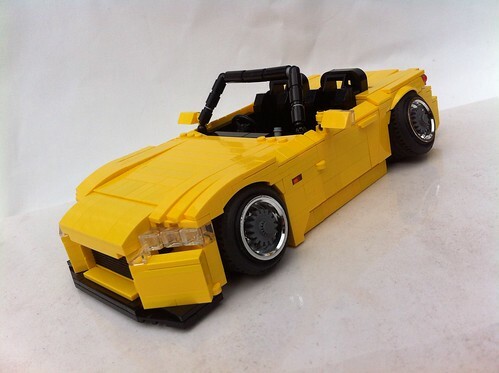 AadenH (on MOCpages and Flickr) has built a ’03 Honda S2000 AP1 with a ‘stanced’ theme. There’s some neat details in his build (especially the wheels). Thanks for your suggestion. This meets all our criteria and will be blogged 14th November 2013. I just found this really cool ETF mining truck. Thanks for stopping by. Wow, that is one hell of a model. Unfortunately the pictures aren’t quite good enough to be published on the homepage, however we’re now watching this builder. Thanks for your suggestion. This meets all our criteria and will be blogged 22nd November 2013. Oops, I just now saw that you are not interested in self promotion. Please don’t hate me. I don’t want elves messing with me in my sleep. Thanks for stopping by. Correct, we’re no longer taking self promotions, however it looks like others have suggested your MOC too. It meets our criteria, so congratulations; you should see it here very soon. As for the Elves, agreed. In large numbers they’re actually quite formidable. Nevermind about the larger photo. There was an error loading the page and it came out as a 1 inch wide thumbnail. Refreshing the page seemed to fix it. PS : sorry for my english, it’s not my primary langage. Apologies, we’re not sure. We’ve made no changes so it must be a WordPress glitch. We think the site is back to normal now (at least on Safari), please let us know if it isn’t for you and we’ll contact our hosts. Thanks a lot ! Everything back to normal for me (Chrome). Thanks for stopping by. Your creations are up due today! You’re latest work has been blogged on the 19th December 2013. Thanks for stopping by. You are very welcome to blog anything you find here at The Lego Car Blog. We’ll email you too. Guys, I´m doing the writeup of the “Industrial Diorama”, which you guys can featuer as a special (if you still want to, and if my stuff is up to par, of course…). But whereto do I send the document¿? Thanks for stopping by. Your suggestion meets our criteria and has been blogged on the 26th December. Hi guys from TLCB. Thank you for posting my Tractor with Butterfly mower on May the 5th 2013! After half a year of building, I present a MOC that is, even in reality, a rare thing. It’s both a Tractor and a Truck and it is allowed on the highway. It is also in the rare color orange and is very powerful. The review is on http://mocpages.com/moc.php/377202 and the movie is on http://www.youtube.com/watch?v=xCnaaecLYPQ. I hope it meets the criteria. Thanks for stopping by and congratulations on your superb model. Unfortunately we’re no longer taking self-requests, however to any of our readers looking at this, click the link above! Sorry, I didn’t know that. Thanks for your reply. Our fault entirely Mr. Hogenhout; this page was updated and the ‘no self requests please’ bit inadvertently removed. This has now been re-instated. In case you’re interested, your creation does indeed meet all of our criteria – a suggestion from another builder would therefore generate a post. I think they are very realistic! Thanks for stopping by. Your suggestion will be appear on the homepage on December 31st. Thanks for stopping by. Your suggestion will appear on the homepage on January 4th 2014. I would like to see more interviews with builders. Maybe with MortalSwordsman, Bing Bong Brothers, Nick Barret, and Rolic? Thanks for stopping by, and for your suggestions. hey guys, testing 1,2 ,3.
and here’s a group i made, with many great creations in that you might wan’t to look at. thanks! Thanks for stopping by. Your suggested creation definitely meets our criteria, and we have in fact blogged a creation by the same builder this week. We’ll wait for the builder to complete this MOC and then we expect to post it here. That’s a nice looking group you admistrate. The Elves will be encouraged to visit! okay thanks. i understand, it would be odd having the same builder on the space of a few blogs. just really testing to see if it works, and to thank you guys for what you do. do you think you would blog a LDD (rendered by POV-Ray) 18-wide 1665 Pontiac GTO if it is any good? sorry, 1965. *face-desk* and you guys can call me Sam if it makes it easier. Hello Mr. Manperson a.k.a Sam. The Elves are ‘trained’ to find any creation that meets our criteria (which you can find in a link at the top of this page). Digital MOCs rarely get featured here, but it has happened once or twice. However we do not take submission self-requests. Thanks for stopping by. That’s very cool. We don’t usually blog modified official LEGO sets but to anyone reading this – click the link above to see 42006 plus PF. A good friend of mine named Mikey McBryan up in Yellowknife Canada works for a company called Buffalo Airways. This company is also the basis for the show Ice Pilots. Mikey is trying to get their iconic airplane, the Douglas DC-3, made into a LEGO model. Its a great project that showcases a revolutionary aircraft from the 1930’s thats still flying up in Northern Canada. It would mean so much to us if this project could be featured on your site! Thanks for stopping by. We’d love to feature this model. However, we only post ‘new’ (i.e under a week or two old) photos here, so… if Mikey has a few new pictures (or could take a few more) we’ll happily blog them! Just let us know. We’ve got a few new ones, and could take more if you’d like. Is there an email address I could send them to? Your suggested creation definitely meets our criteria, it’s ace! Unfortunately the pictures aren’t quite up to code. If you can encourage the builder to take some good, clear, natural light pictures we’re in business! I was going to suggest this one too. Nice spotting, LEGOMike! Hello LEGOMike and Mr. Pieces. Thanks for stopping by. Your suggested creation meets our criteria and will be blogged 25th January 2014. Thanks for stopping by. Your suggestion meets our criteria and will be blogged on 28th January 2014.
you guys fancy a (rendered) LDD rarity? http://www.mocpages.com/moc.php/379720 the detail is incredible. Thanks for stopping by. Your suggestion is a superb digital creation, however we very rarely publish LDD creations here, instead choosing to focus on real builds. also, another new kid on the block. Thanks for stopping by. Your creation meets our criteria and will be blogged on 28th January 2014.
thanks guys, he fully deserved it! Also, the almighty Alexander Paschoaletto is back, with a Porsche Carrera GT!! Thanks for stopping by. Your suggestion does meet all of TLCB’s criteria. However, unfortunately we’ve blogged several large scale supercars built from Ferrari Racers parts recently, and as such on this occasion your suggestion won’t be blogged. this builder is really good and needs recognition! oh sorry, it’s december 26th… but please ay attention on his future MOC’s, he’s brilliant! Thanks for stopping by. We always like to hear from previously blogged builders! How would you like to be a Guest Blogger for this post? now I understood. sure I would! Send us your text and link to your chosen image to , and we’ll post your guest blogging! also, you might want to keep an eye on a contest i made a while back (http://www.mocpages.com/group.php/23523). hopefully, there should be some great entries! Thanks for stopping by. The build meets our criteria, however unfortunately the photos do not. As such we won’t be blogging your suggestion on this occasion. I’ve send the e-mail. did you recieve? We have, and we’ll publish your guest blogging shortly. Thanks for stopping by. Wow – that is one the best Technic cars we’ve seen too. We would love to blog this, however we require a clean-background photo first, either through editing an existing image or via a re-shoot. With this achieved we will certainly publicise this creation. I’ve checked out the criteria, and I now have one that fits perfectly! Beautiful engineering, and a whacky design – what could be better? Okay, I am absolutely drooling over this one. It’s another work of 2LegoorNot2Lego. It’s a bell B30D with tracks. Apparently it’s based off of a real prototype that was made. Wow, what an awesome creation! Unfortunately it’s much too old for us to post here. To see read the guidelines on suggested creations scroll up and click the link at the top of this page. Thanks for stopping by. No problem, we only tightened the rules a little fairly recently (it’s a great looking creation though). Your suggested creation meets our required criteria and we will see if we can publicise it later this week. Thanks for stopping by. Yes, we will be doing more Master MOCers interviews this year. We have one in progress and another planned before Easter. We hope you enjoy them! Can you tell me who you will interview? when will you post these inteviews? Oooh, sounds interesting! Can’t wait! Thanks for stopping by, and for your suggestion – which definitely meets all of our requirements. 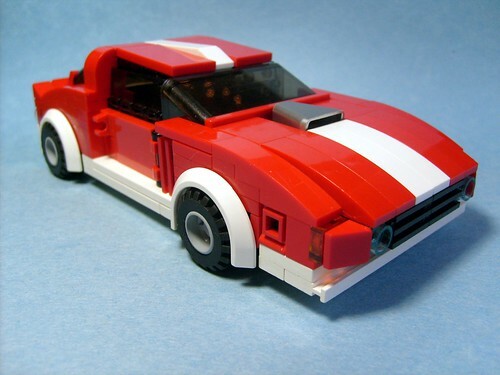 We actually blogged this model on Dec 27th (https://thelegocarblog.com/2013/12/27/unijeep/ via Eurobricks), however we have now included your link to the new MOCpage detailing this model. Thanks for stopping by. It is indeed great work, but unfortunately the images are not good enough for us to use. If you know of any better images of this creation please let us know. Thanks for the update. This creation has been blogged February 14th 2014. Thanks for stopping by, and apologies for the delay in replying – your comment went into our junk folder. Normally we just empty it without reading anything in it, but we caught your link by chance. Your suggestion was blogged 14th February 2014.
http://mocpages.com/moc.php/381582 I think this truck is really brilliantly designed. It’s pretty big and has some great details…. Thanks for stopping by. Your suggested creation will be blogged 20th February 2014. Well thanks to discovering this website this week and a 20% off sale at a local dept. store, I now have a large heavy box with 42009 printed on it – first Lego I’ve bought in several years. Looking forward to putting that one together when I have a spare week. Also hunting down a Unimog….. Your reviews are utterly, utterly brilliant. Keep them coming! I think it would be a great model to show here. Thanks. Thanks for stopping by. Your suggested creation will likely be blogged this week. A nice idea, however it completely depends on whether said models meet our criteria, and also whether we think our readers will be interested. As such I’m afraid we can’t promise this a guaranteed blog post, but we are of course open to such models. Thanks for stopping by. How would you like to become a Guest Blogger for a day? If you would, let us know by reply and we’ll send you an email address where you can submit the text for your post. Hey guys, more fantastic work!! Give the Elves a little pat on the back. Anyway, I was just wondering what a ‘Featured TFOL’ was. I know what a TFOL is, but does the featured part mean they/their MOC have been blogged, or they’ve got an account and been a guest blogger? Also, is their such thing as a featured KFOL? The ‘Featured TFOL’ category is used when we blog a creation/s by a teenage builder, although the focus is often more on the builder than the builds. This category allows us to blog a creation that perhaps is a little short of meeting our usual post guidelines, but where we feel the builder is ‘one to watch’ and deserving of recognition, something that is not yet done by the other established Lego blogs. There are no current plans for a ‘Featured KFOL’ category. However any builder, no matter how old they are, may see their work appear on TLCB if their build meets our blog guidelines (these can be found in the main menu). Thank you, that answers it perfectly. ;D As for a suggestion, I would ‘keep an eye’ on this contest – http://www.mocpages.com/group.php/23802 – that may also appear on Flickr soon. The 4-wide master Sound wave Starscream is judging, maybe along with some others! Should have some excellent entries…. *Only redeemable for pride and kudos. Don’t see where the elves found it quite yet. Though, it’s a fairly recent build from the looks of it. Thanks for stopping by. Your suggestion meets our criteria and will be blogged shortly. Thanks for bringing it to our attention. Hay, folks! How you guys doing? I saw this incredible car here (http://www.mocpages.com/moc.php/384074) with much less recognition than it should have. He’s very skilled! Thanks for stopping by. Your suggestion will be blogged 30th March 2014. Hey chaps. The results for Motoring March (http://www.mocpages.com/group.php/23802) will be coming very soon, so keep one lazy eye on it. I have a sneaking suspicion Senator has the victory under his belt…. Nice truck with combine harvester! Thanks for stopping by. It is indeed! Unfortunately the pictures are a bit too blurry for us to use, do you know of any better ones? The 15-piece challenge results are in chaps, if you want to take a nosy. Thanks for stopping by, and for your excellent suggested post. This will be blogged today (May 12th). Thanks for stopping by and suggesting a creation. It meets our requirements and thus will be blogged later today (May 19th). Or alternatively, how would you like to be a guest blogger for the day? If so just let us know and you can write the blog post! Holy geese! That’s quite an honour. I’ll give it a go. If it’s terrible, then it can always be changed…;D Thanks guys, that’s really kind. Great to have you on board for a day. Please send your text and hyperlinks via FlickrMail as soon as you’re ready. There’s a Special post coming soon – watch this space! This sounds good. Is that to be an interview with Sheepo? That’s big. Dunno if you guys have seen this absolutely delightful Reliant Robin yet, but if you haven’t, I think you should! Thanks for stopping by. We’d like to offer you the opportunity to become a guest blogger to publicise this creation. If you’d like to accept this please contact us via FlickrMail. HI guys! I’ve noticed you’ve been posting a few more LDD MOCs recently- and in my opinion, this a great! I know the Elves like creations they can physically touch, play with and throw, but I think LDD builders deserve a bit more praise. I’m not saying this because I’m a LDD builder myself and I WUNT MOR COMMENTZ PLZ! !11!, but I honestly think people don’t take as much notice of LDD builders. I think the main reason is they’re first reaction is “well, they have infinite bricks in what ever colour they please, and where’s the fun in that?”, but LDD has it’s pros and cons, mostly the latter. Yes, you can have what ever piece you please. But you can’t stretch tyres. You can’t use certain connection techniques (e.g. putting a plate in a clip) . There’s limited printed tiles and no stickers. You can’t use pieces such as minifig hands. So there’s some things that would make it more difficult. And, even with the fantastic LDD – POV Ray, the pictures don’t do the MOC any justice. So I’m glad to see a few more LDD creations being blogged, and hope to see more in the future. We aim to feature a wide variety of vehicle styles here at TLCB and thus digitally created images will feature from time to time – we’re pleased you like what has been published so far. We would like to stress that our preference remains for real bricks, and also that – as you rightly point out – images are often of lower quality for digital creations, thus meaning that they do stand less chance of appearing here. I have done some MOC about the batmobile. Hope you may like it. Apologies, although your creations do look excellent, we do not accept self-requests. However, to our visitors reading this; click the links above ^ to see Thammanoon’s Batmobile models. Apologies, although your creation does look excellent, we do not accept self-requests. However, to our visitors reading this; click the link above ^ to see Andre’s RC Bugatti Veyron. Thanks for stopping by. We use this policy as many builders are, er… ‘over-confident’ in their abilities. Many thanks for getting back to us! We’ve have your email now. Would you be interested in a review of set 8258? It’s a notable omission from your otherwise excellent review database in my opinion. I’ve been told my writing skills are at a vaguely alert 12 year old level (an excellent result as this exceeds my mental age). Oh, and this website is a significant reason I came out of my dark ages earlier this year. My bank account hates you all. Thanks for stopping by! We’d be very interested in some free labour. Er, we mean, some reviewing talent. 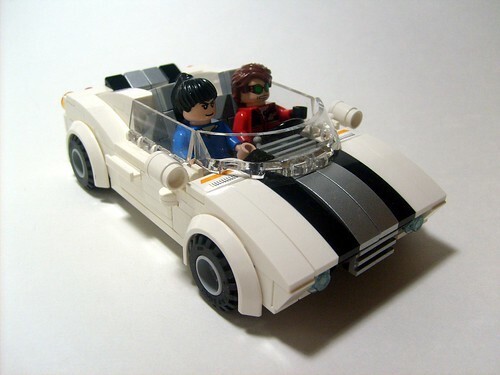 You can contact us on Flickr (search ‘The Lego Car Blog’), or at pierrepanhard@rocketmail.com. Hi guys! Just wondering what you thought of Alexander P’s latest -the Pagani Huayra (http://www.mocpages.com/moc.php/392115). I think the ambitiousness-uss-ness-ness of it is incredible, but to pull it off quite well with lovely details and functions? I think it deserves a blog. I know you’ve posted a lot of his stuff lately, but this is pretty impressive. Thank you for your suggested MOC. It does meet all of our criteria, however as we’ve blogged both this build style and builder a few times recently, on this occasion we won’t be blogging his work as we like to keep our blog contents varied. However do keep your suggestions coming. That is fine, I suspected this would be your answer. You may want to take a look at Harry Gravett’s latest MOC, which is to die for, in my opinion. I know there’s the rule of no self-promotions, but you moght want to keep an eye or three on this group, which is soon to start involving contests, blogs, and we’ve already had our first exclusive interview with none other then Aaden Hughes. Great suggestion re: the Ferrari. Would you like to return as a Guest Blogger? Me and Harry have been good ‘friends’, so to speak, over the past year, so this could be interesting and good fun! Thank you for this great opportunity! We don’t feature self-requests but we have had a look through your (excellent) blog. To visitors reading this, copy the link above to see MM2000’s work. Hello again! I just thought the Elves would enjoy this MOC as it’s yellow, with stripes. Everyone will enjoy it because it’s a perfect and beautifully crafted BMW 2002 Turbo. And if you were going to offer, I won’t have the time to be a Guest blogger – I’m cracking down on my own super car (see photostream). Thanks for stopping by, and for your suggestion. Coincidently this builder is due to feature this week. Thanks for stopping by, and for your suggested creation. Your suggestion will be blogged shortly. Change original 10220 Volkswagen Camper to an art piece ! Marat’s rental truck is due for appearance tomorrow. I’m not sure what plans you may have for a Master Moccer interview, but I think Senator Chinchilla would be a great candidate for one. His content is consistently amazing, and nothing this side of a pink Polar bear on a toaster is quite as funny as he is. We do not usually respond to self-promotional comments, however we’ve been waiting to see your Mustang pictures for a while, and as such it’s on our ‘to blog’ list and will appear here shortly. You should blog this amazing F1 car someone built. Your suggestion meets our requirements and will be blogged shortly. Thank you for blogging several of my creations. However I’d like to suggest a Moc of a friend for blogging. Its a transforming Ghostbusters Ecto-1. The best thing about it, is from the outside you just wouldn’t know it was capable of transforming and that it was any different from the Lego Ideas set! The transformed Mecto-1 is pretty awesome too. If this meets the selection criteria, please don’t mention me! I think this is one of the best creations of the year! It would be great if you could add my blog to your directory. Thanks! I’ve added TLCB to our blog list. Thanks for stopping by, and for adding us to your blog. We wouldn’t normally add such a new blog to our directory (as new blogs come and go all the time), but you do look quite pro – more so than us anyway. As such we’ve bent the rule a little this time and a link to your blog will appear in our ‘Friends’ section. How would you like to Guest Blog this? Let us know and we’ll be in touch with the details. I’d be very happy to guest blog this, but I dont know if I am able to make an writing that is interesting enough. I’d sure like to try, though! Great stuff. We’ll Flickr Mail you. 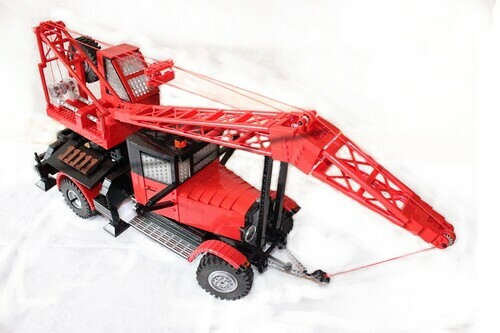 Can you tell us more about this model – as it does look like a modified official Crawler set. Thanks for stopping by. Your suggestion meets our criteria and will be blogged shortly. Nice try! However we do only blog newly uploaded creations, and we also don’t encourage self-requests. But – we have ‘Followed’ you as a Flickr contact, and your creations do appear to meet our requirements (besides age). Thus we will be looking out for new uploads from you in the future. Was browsing through his site and noticed this is from 2005 and not recent. Sorry! No problem – it is indeed too old but otherwise it’s exactly what we expect from a Submission Suggestion. hey guys! can i do some self promotion :P? Thanks for stopping by. We don’t officially respond to self-requests, but this is too cool not to. On this occasion we aren’t blogging your suggestion, however we have now ‘Followed’ this builder as their work is close to the standard we look for. Thanks for stopping by and for your tip. We have now ‘Followed’ this builder as their work is close to the standard we look for. A great suggestion – but a nice clean background would help us to blog this. Saw a nice military truck on Flickr today. Your suggestion meets our criteria and has been blogged. I’m a big fan of your blog and I read it every day. This is a beauty! The man deserved to be on your blog! The first of your two suggestions will appear here shortly! Thought you might be interested in my 66 Mustang MOC. I also have a gallery of the other hot rods I’ve made. Thanks! We don’t take self requests, but your builds are close to what we look for. If you have a Flickr account let us know and we’ll follow you. New vehicles coming from keko007. Your suggestions meet our criteria and will be blogged shortly. Your suggested creation is due to be blogged soon! We are following this builder as their creations are close to what we look for. If I have a worthy creation to submit but no online exposure or website how may I approach this? Is there a way to send photos and statements for review? should I just create a flickr and post a link? We do not take self-requests, but we do highly recommend setting up a Flickr account – it only takes a few minutes. Once your account is running we would advocate joining a few groups, following some builders, and commenting on others’ creations – get involved in the community and you will become part of it. You can add us too (search for ‘The Lego Car Blog’) and we’ll then be able to see what you’ve built, and our Elves might start taking trips to your pages. We’re on the same page – it’s due shortly! Hello, I would just like to leave a link to this amazing car builder: Davanchi M.
And I don’t want to be rude but Please check out my creations! Oh, nevermind. It looks like Davanchi has already been featured. Your suggestion has appeared here as a ‘Featured TFOL’. Use the search function at the foot of the page to find posts relating to this topic. Hello TLCB Team, my Flickr contact Luca Rosconi rarely build an F1 model.But when it comes out, it’s truly something to celebrate. Davanchi M’s really nice model. You should check out Alexanders Lancer Evolution. It really worth it. As this creation is currently titled ‘Work in Progress’ we’ll wait for the finished article, but it does meet our blogging criteria. Your suggested creation is good, but not quite good enough to appear here yet. It’s close though. I think you should look here: http://www.mocpages.com/moc.php/404867 or here: http://www.mocpages.com/moc.php/403855. The second of your suggested creations is unfortunately ineligible to be blogged here due to inadequate image quality, although the creation itself is good. However your first suggestion meets our criteria and will be blogged shortly. have you seen Er0l’s MF scale Daytona Spyder? For me it’s the best I’ve seen in this scale! Your suggestion meets our criteria and will; be blogged shortly! Your suggested JU88 looks excellent – we’ll await the finished model and look to blog it here once it’s finished! MOCpages is having one of its ‘moments’ currently, but we’ll check this out once it’s operational. UPDATE: A good model, but unfortunately the images are not of sufficient quality for us to use them. Sorry for the delay in responding tom you – we’ve had a backlog of creations to clear! Your suggestion meets our criteria and thus we’ll try to blog it soon. UPDATE: Your suggestion meets our criteria and will be blogged shortly! Lamborghini’s 2016 car. The Lamborghini Ankonian! To quote the designer. A truly amazing build by Ron Dayes. Your suggestion, whilst a good model, doesn’t quite meet our criteria on this occasion (being low resolution LDD), however it is amongst the sort of creations that we do post so thank you for your submission. How about this little Rat Rod from zenn? So do we, it’s due to appear here shortly! Here’s my most recent creation, hope you like it! We do like it! But, as stated in our Submission Guidelines, we do not take self requests. The 2015 Fifteen Piece Vehicle Challenge has in fact already featured here – you can use the search function to find it. Whilst your suggestion is a good one on this occasion we won’t be blogging it (scheduling issues!). Thank you though! We like the way you think! Your suggested creation/page is due to posted soon. Just a quick submission suggestion. This Unimog is great. Found it on youtube and then the guy has his MOC pages account also on his page. A Unimog that actually drive like one! Goes in water just like a real one would. This may be cool to post. Best to post the video though…. don’t know if you guys ever do that? We don’t usually feature creations with non-LEGO parts (see submission guidelines), but we may explore a feature on ‘Non-LEGO’ modifications soon – it’s a great model! We’ll be blogging some of your suggestions shortly! 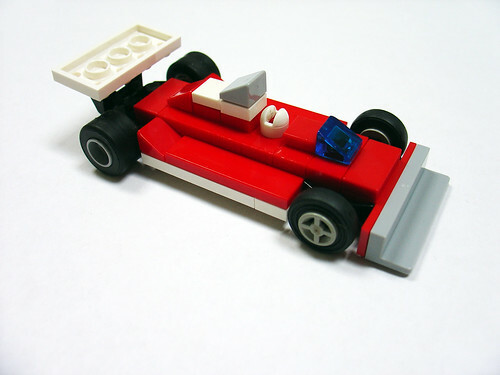 The mantra of your website is ‘The best LEGO cars on the Web’. have you seen this amazing Technic long nose truck? The Elves aren’t trusted with a computer, so I (generic TLCB Team Member) am replying on their behalf. Indeed they have! This model will appear here shortly (are your sure you’re not an Elf?). Both suggestions are good, however the second is LDD so, whilst it’s excellent, we won’t feature it here. However, would you like a Guest Blogger slot to write-up a post for the R8? If so reply here incl. your email address (we’ll remove this from the comment once we have it) and we’ll let you know how you can submit some words! Hi, folks, how you doing? Someone elses creation – eeer fail – all mine I’m afraid! TopTableModels.com or toptablemodels on Facebook – Lego Concorde and SR-71 kits. Ahh – reading up I see you are quite strict on people suggesting their own MOC’s … sorry – ignore my suggestion. We highly recommend adding your creations to Flickr – it has the potential to reach many like-minded builders as we’ll as blogs like us. You can find us on Flickr too – add us and we can see what you’re building, and thus you could end up here! I must be being a bit thick, I am on flickr, but I have no idea how to add you? are you a group or a person? I can find a page about you, but there is no join button? Your suggested creation is very good, but not quite TLCB standard. It’s close though, so you’re on the right lines. Rhys’ has just posted his new MOC and it is just spectacular. You think the same way we do – this creation is about to appear! Check this one out: http://www.nico71.fr/honda-ra-300-1967/ Looks neat to me. Check out Alex Paschoaletto amazing Lamborghini Murcielago SV! 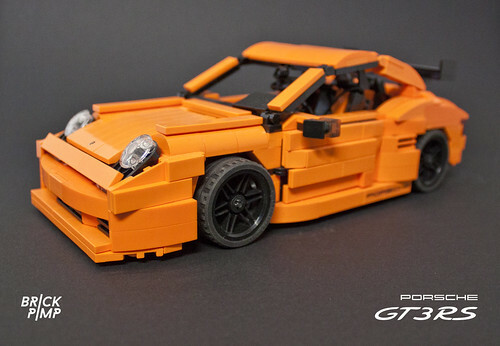 This has to be one of the most beautiful cars I have ever seen made in LEGO, absolutely faultless! We like the way you think! This creation is due to be posted soon. You think the same way we do – this model is in the blogging queue! Your suggested creation was posted as your wrote your comment – see the homepage for the feature! Whilst these are excellent creations, they are much too old to feature here. Typically creations must be under a week old. Your suggestion meets all of our criteria and will be blogged shortly! Wow indeed! Your suggestion meets our criteria and will be blogged shortly. This creation is in the queue to be published soon. We note your name is very similar to the builder of this model – in case it applies, please remember that self-requests are not encouraged. We think the same way you do, it’s in the queue!